I've begun playing with data from the 2016 National Survey on Drug Use and Health for one of my next projects and will be throwing up some graphics as I go through my EDA. 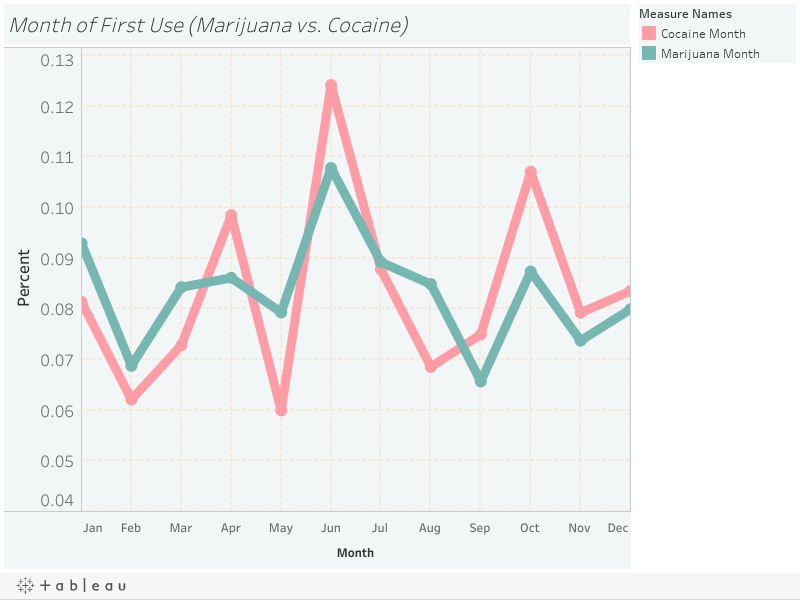 The following shows cocaine users (11.6% of the US population has used cocaine) and marijuana users (41.85% of the US population has used marijuana) by the month they first used that drug. They are highly correlated (0.73 Pearson correlation, with only 0.54% of observations in a 100,000 hacker stat permutation test surpassing this value). With the admitted ignorance of someone who has never studied drug use, my take away looking at the graph above is that there is likely a large overlap in users and/or common seasonal components that drive first consumption. First use for both spikes in June (Summer or end of school celebration?) with a second peak for cocaine in January (investment banker bonus season?) and for marijuana in October (Halloween perhaps?). This is really interesting! Thanks for sharing.